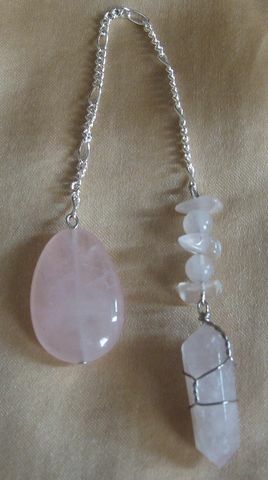 Crystal pendulums are used in energy work to help check the balance of the chakras for animals and people. This one is all rose quartz. Amethyst, clear quartz, aventurine, tiger eye, onyx, tree agate, lapis and jasper are also available. They come in a lovely silver jewelry pouch with instructions for cleansing them. They are $20 each. Custom pendulums are $25 each. Learning Center members please purchase from your home page to access your discount.